The first images of the Marni Foulard Summer 2012 collection by Marni reveal a visual bold explosion of prints and colours similar to what happened in the label’s previous collection. This is another unabashed range of garments and accessories in bold colours and patterns produced as a way to reveal a vibrant clash of cultures and sartorial codes in an upbeat and light-hearted approach to fashion and taste. As expected of Marni, prints, puzzles and collages are laid out with graphic playfulness. 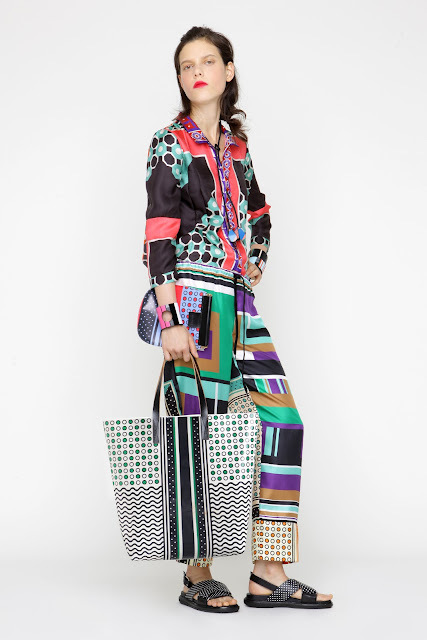 Silk or cotton dresses, tops, skirts, trousers, shorts and accessories are realised in foulard prints, and bright print and colour blocks create innovative visual diagrams on ready-to-wear clothes and accessories. In addition, exotic inspirations are filtered and rendered abstract, associated to geometric prints, tile motifs and multicolour stripes. Accessories (featuring the foulard print) include shopping totes in different materials (including PVC, leather, nylon, and silk), purses in various forms and sizes, and jewellery made from recycled vinyl. The Marni Foulard collection is available at all Marni Boutiques and at www.marni.com.